What should be done to introduce a new system administrator at BMC? 1. Who is resposible for what on the BMC network? Who can help me? See also: There is no wired network here - what to do? This may be you, your department, BMC-IT or client support at UUIT or any other organisation at the university, depending on where you work. Contact Domainmaster (DNS/DHCP/TFTP), Netsupport (Network), IRT (Security) or UU helpdesk (everything else). Physical network copper and fiber. Which VLAN at BMC you would like to use. If you want one or two sockets to be connected. If you only want one, clarify which socket to activate. If you want to connect the fiber somewhere else at the university let us and Netsupport know what your plans are. Directly connect two network sockets Two network sockets connected to the same cross connect cabinet may be directly connected with two patch cables in the cross connect cabinet. 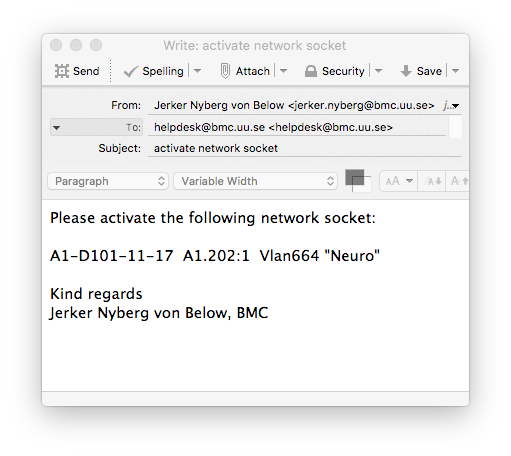 Just send an email to helpdesk@bmc.uu.se with the network socket and cross connect cabinet identifiers. New power socket Talk to Bo Ejdesjö at BMC. Will cost money. Hyresgästanpassning. New pillar with power and network sockets Talk to technical service at BMC. Free of charge AFAIK. All about fixed telephone Talk to teleservice at university. Will cost money. BMC-IT does the cross connect cabinet patching and requests VLAN change. 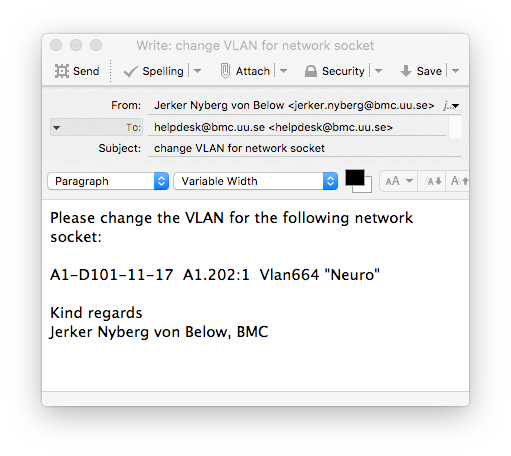 Here is an example how a mail could look like: UUIT Netsupport will do the configuration of VLAN in switch. If you need 10 Gbit/s contact BMC-IT together with UUIT Netsupport. This is available in a few cross connect cabinets. DNS Local IT can do this but should not. Use the BlueCat IPAM system at UUIT. DHCP Local IT can do this but should not. Use the BlueCat IPAM system at UUIT. TFTP / PXE-boot Local IT can do this Use the UUIT TFTP-server. Contact BMC-IT to discuss what can be done. All office corridors should have coverage, or at least they originally had. Over the years more and more equipment is using the wireless network or the free frequencies used by the wireless network for different purposes. An approximate cost would be 3000 SEK for the network socket and 5000 SEK for the wireless access point. Current delivery times are around two months for a new network socket to be installed and the wireless access point to be delivered and set up. With a start in 2018 the IT-division will upgrade the network at BMC to a new generation of wireless hotspots. Most of the switches and wireless hotspots will be upgraded. It will take some time for this to be completed. If you have a laptop computer with no ethernet port you can use a USB-adapter for attaching the wired network to the computer. Some laboratory instruments and door locks also use the same free frequences. It is not much we can do, the equipment manufacturers and the landlord / facility providers do not always have the same priorities as us (IT-support and network users). UUIT Netsupport may together with BMC-IT install new wireless hotspots. This may cost money. All public rooms for students should have coverage. The IRT-group has disconnected my computer from the Internet! Contact your Local IT to fix your computer Let the Local IT contact the IRT-group to open the router filter when computer is fine. My Internet do not work! Help! Check how to find the cause of the problem here. Finding configuration problems in the local computer is a job for Local IT. If it should work but get no link then perhaps switch port is broken. Contact helpdesk@bmc.uu.se. If a network port has been unused (no link) for over 300 days the switch port may reused for something else. If you want unused connectors to keep being active you have to use them from time to time. This counter is automatically reset in the switch so the network socket just has to be connected with an active link for a short time. This might be a magic network problem. Then contact UUIT Netsupport. Sometimes the Security division may have blocked an IP. So if a specific IP do not work but others do then this may be the case. This may have happened years ago when an old unpatched computer was using that IP.